(CNN) The first human trial of a Zika vaccine will begin soon, Inovio Pharmaceuticals said Monday. Inovio, which is based in Plymouth Meeting, Pennsylvania, and GeneOne Life Science, which is based in Seoul, South Korea, worked together on the vaccine. They previously collaborated to create vaccines for Ebolaand MERS, both of which are being tested. The Zika vaccine, with the clinical-sounding name GLS-5700, will first be tested in 40 healthy volunteers. The first tests in humans should start in the next few weeks, Inovio said in a news release. In the animal testing stage, the vaccine caused a strong antibody response, the company said. It is still very early in the vaccine’s development. Phase I of a vaccine trial ensures that it can be tolerated well in human subjects. If successful in this first round of human testing, it will need additional approval for further testing. At the next stage, the vaccine would be tested on people who have Zika. Then there would be a stage to see how well it works on a larger group of people. Dr. Anthony Fauci, director of the National Institute for Allergy and Infectious Disease at the National Institutes of Health, is leading a team that is trying a few approaches to a vaccine, including an approach using DNA like Inovio’s does. He believes that trial could start by the end of August. In the coming months, he said, we will probably be hearing about a number of vaccine candidates going into Phase I trials. “This is all good news,” Fauci said. In 2013 a boy who was given the HPV vaccine died almost two months later. Two quick questions: First, does this worry you? And second, do you believe that the vaccine caused the boy’s death? This is a real case reported in the Vaccine Adverse Event Reporting System (VAERS). VAERS is monitored by health experts at the Centers for Disease Control and Prevention and Food and Drug Administration to detect very rare or emergent harms that may be caused by vaccines. The vast majority of adverse events reported in VAERS are mild (such as fever), but a few are serious, like death and permanent disabilities. Staff follow up on certain cases to better understand what happened. A growing number of parents are refusing to vaccinate their children, and one reason they often state is that they do not trust that doctors and government agencies sufficiently research the potential harms of vaccines. Given that, we wanted to find out whether telling people about VAERS and the information it gathers could influence their beliefs about vaccine safety. It’s important to stress that just because a case like the one mentioned above is reported to VAERS doesn’t mean that the vaccine caused the problem. That’s because VAERS is an open-access reporting system. Health care providers are required to report certain adverse events, but they are not the only ones who can contribute to the database. Anyone can make a report in VAERS for any reason. Similarly, anyone can access VAERS reports and data. In fact, advocates both for and against vaccines refer to VAERS data as evidence of either the existence of harms or the rarity of harms. This open-access feature makes VAERS a potentially rich source of information about possible vaccine-related harms. It also means, however, that the events reported in VAERS often turn out to have nothing to do with a vaccine. The fact that there were no reported problems for almost two months between the vaccine and the child’s death might make you, like us, skeptical that the vaccine was the cause. Yet, it is important that the death was reported so that it can be followed up. Being transparent about risks is critical to building trust. In fact, that’s part of the reason that VAERS data is available to everyone. Does VAERS make people trust vaccine safety? It seems plausible that describing VAERS in depth could build trust. Doing so would demonstrate that every effort is being made to collect information about potential vaccine harms, and that even with such a comprehensive effort very few serious events are reported. Further, transparency would also show that these few serious events are not necessarily caused by the vaccine, and this information is available for anyone to view and evaluate. We decided to test this idea in a recent internet survey. We surveyed over 1,200 people, who were divided into three groups. One group received the standard CDC Vaccine Information Statement for the HPV vaccine. We chose the HPV vaccine because this vaccine is particularly underutilized. The second group was given detailed information about VAERS – what it is, what it is for and what it contains – as well as the number of serious adverse event reports received about HPV. To be specific, this group was told that there were seven deaths and 24 permanent disabilities reported for the HPV vaccine in 2013 out of a total of approximately 10 million vaccine doses given that year. A third group received all of that information and then also read the actual adverse event reports in detail. We hoped that reading these reports would show this group that not all of these deaths and permanent disabilities were caused by the vaccine. We found that telling participants about VAERS, without having them read the actual reports, improved vaccine acceptance only very slightly. Even worse, when participants read the detailed reports, both vaccine acceptance and trust in the CDC’s conclusion that vaccines are safe declined significantly. What we found next surprised us: The vast majority of our survey respondents, the same ones who were less accepting of vaccines and less trusting of the CDC, said that they believed the vaccine caused few or none of the reported deaths and disabilities. This means that the individual stories of perceived vaccine harms were highly influential, even when people didn’t believe they were true. Think back to your reaction to reading about the tragic death we described earlier. Our data suggest that just learning about this death may have caused you to feel more negatively toward the HPV vaccine, even if you believed that the vaccine did not cause the death. While we can’t say that everyone reacted to the stories the same way or to the same degree, it seems clear that at least some people didn’t believe that the vaccine caused the reported harms, but they were nonetheless negatively influenced by those reports. Systems like VAERS are essential for public health, providing an opportunity to learn about and investigate every possible case of potential harm caused by vaccines. But the power and emotion evoked by the stories of VAERS reports may influence us and undermine trust in vaccines, no matter what our rational mind might think. Parents have a responsibility not only to their own children, but to their communities—it’s only by achieving a very high level of population immunity that outbreaks can be prevented. Vaccination is particularly crucial for children with cancer and other diseases that cause immunosuppression. They cannot be vaccinated safely, but are at high risk of severe consequences if they are infected—and, thus, they depend on the community’s so-called “herd immunity” for protection against a potentially fatal illness. While some parents continue to express concern about a possible link between vaccines and autism spectrum disorders, the original report claiming this connection has been debunked and retracted. A large number of carefully designed follow up studies have been carried out, and the overwhelming weight of scientific evidence shows no evidence for such a link. That’s why it continues to be so important to get the word out to parents: Have your kids vaccinated. Vaccines aren’t linked to autism. The number of vaccines children receive is not more concerning than it used to be. Delaying their administration provides no benefit, while leaving children at risk. All the childhood vaccines are important. The entire article does a good job summarizing current research in the field of vaccines and discrediting the comments from the GOP debate. The final message? All of the vaccines save lives. It would be better for our vaccination policy for this not even to be a topic for debate, certainly not by those who aren’t immersed in the science of vaccines. Debating any of these facts does no one any good. Remember Kaci Hickox? The nurse that New Jersey Governor Chris Christie quarantined when she returned from West Africa during the ebola outbreak because he ignored the science and gave into Ebola fear-mongering? She is now calling out the Governor for his anti-science stances, this time when it comes to his recent statements on vaccines. Turns out Kaci has a heck of a lot more experience with measles than Chris Christie!! More info on Kaci’s statements here. I think this is a good example of Gov. Christie making some very ill-informed statements. We heard it a lot during the Ebola discussion, and now it seems to have happened again. Dr. Anthony Fauci, director of the National Institute of Allergy and Infectious Diseases, talks with Rachel Maddow about the health risks associated with not being vaccinated, and the importance of dispelling the myths behind the anti-vaccination argument. The measles outbreak traced back to Disneyland has spread to eight states, with as many as 95 cases reported by January 28. Media outlets are highlighting the rise of anti-vaccination sentiments. Scientists are expressing their dismay at people who reject sound medical advice and put their families and communities in harm’s way. Measles was considered eliminated in the United States in 2000. But if the first month of 2015 is any indication, this year will easily beat the record number of measles cases recorded in 2014. The narrative during this outbreak, or any measles outbreak really, is that measles is a highly transmissible disease. So transmissible in fact that 90–95% of people must be vaccinated in order to protect the entire population, or achieve what is called herd immunity. That is partly true. Measles is highly transmissible, not least because people can be contagious days before symptoms develop. But there are three problems with this line of reasoning about vaccination rates. First, the numbers are based on calculations that assume a world of random mixing. Second, the vaccination coverage is not a perfect measure of immunity in the population. Third, and most problematic in my view, it gives people a seemingly scientific justification for not getting vaccinated – after all, if not everyone needs to get vaccinated in order to attain herd immunity, can it really be so bad if I opt out of it. What exactly is herd immunity? Let’s look at the concept of herd immunity first. The basic idea is that a group (the “herd”) can avoid exposure to a disease by ensuring that enough people are immune so that no sustained chains of transmission can be established. This protects an entire population, especially those who are too young or too sick to be vaccinated. But how many people need to be immune to achieve this? In order to calculate the number of people who need to be immune for herd immunity to be effective, we need to know how many people will get infected, on average, by an infectious person. Imagine that a newly infected person will on average pass on the disease to two other people. Those two will each infect another two people, who will themselves pass it on, and so on, resulting in the classical pattern of an exponentially growing outbreak. In order to stop the growth in the number of transmissions, we need to ensure that each individual case causes, on average, less than one new infection. So, let’s say that one case leads on average to two more infections, but instead we want that number to be less than one. That means at least 50% of the population needs to be immune, so that at most, only one of the two people who might have been infected by an individual will be. When the vaccination coverage reaches a certain threshold, full herd immunity can be attained in principle. How many people need to get vaccinated to achieve herd immunity? So, how do we calculate what fraction of a population needs to be immune to reach herd immunity? First, we need to know what the reproduction number, or R, is. That’s how many new cases a single case of an infection will cause. Imagine that you are infected in a completely susceptible population, and you pass on the infection to five other people (ie R=5). In order to prevent an outbreak, at least four out of those five people, or 80% of the population in general, should be immune. Put differently, 20% of the population may remain individually susceptible, but the population would still remain protected. So if you can estimate the reproduction number for a given disease, you can calculate the fraction of the population that needs to be immune in order to attain herd immunity. For influenza and Ebola, the number R is about two. For polio and smallpox, it is around five to eight. But for measles it is much higher, somewhere between 10 and 20. And because of that, the goal for measles vaccination coverage is typically around 90-95% of a population. But there’s a problem with this calculation. 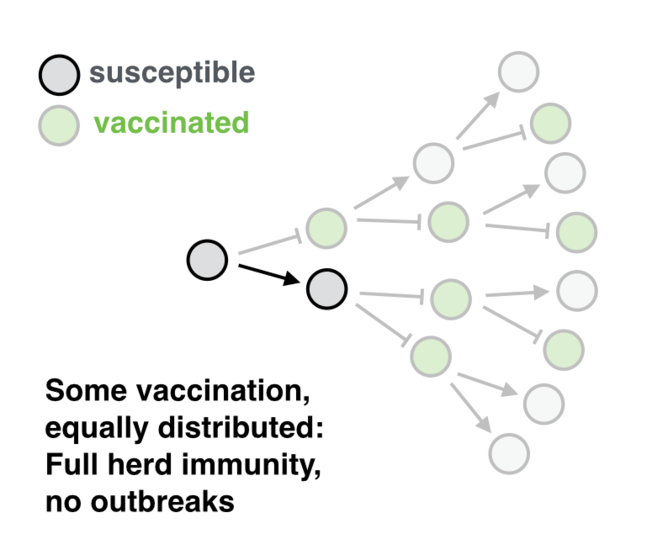 The assumption underlying the calculation for herd immunity is that people are mixing randomly, and that vaccination is distributed equally among the population. But that is not true. As the Disneyland measles outbreak has demonstrated, there are communities whose members are much more likely to refuse vaccination than others. Geographically, vaccination coverage is highly variable on the level of states, counties, and even schools. We’re fairly certain that opinions and sentiments about vaccination can spread in communities, which may in turn lead to polarized communities with respect to vaccination. And media messages, especially from social media, may make the problem worse. When we analyzed data from Twitter about sentiments on the influenza H1N1 vaccine during the swine flu pandemic in 2009, we found that negative sentiments were more contagious than positive sentiments, and that positive messages may even have back-fired, triggering more negative responses. And in measles outbreak after measles outbreak, we find that the vast majority of cases occurred in communities that had vaccination coverages that were way below average. The sad truth is this: as long as there are communities that harbor strong negative views about vaccination, there will be outbreaks of vaccine-preventable diseases in those communities. These outbreaks will happen even if the population as a whole has achieved the vaccination coverage considered sufficient for herd immunity. 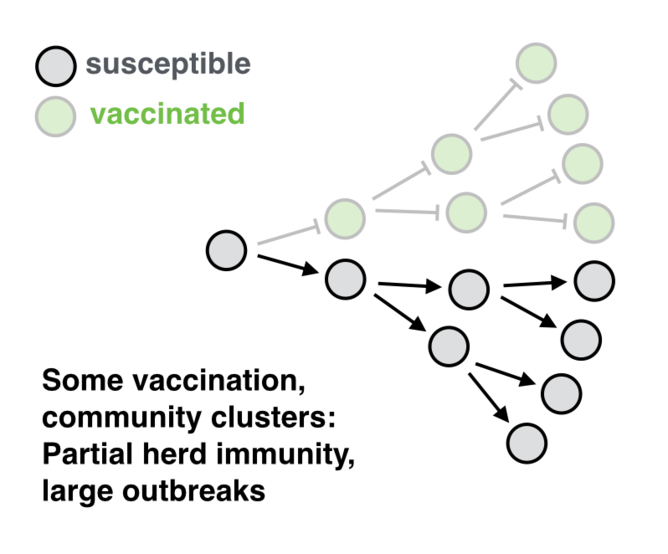 When vaccination is not equally distributed, but clustered in communities, large outbreaks are possible even when vaccination coverage in the overall population is high. If negative vaccination sentiments become more popular in the rest of the population as well, we may start to see more sustained transmission chains. Once those chains are sufficiently frequent to connect under-vaccinated communities, we may again be in a situation of endemic measles. The solution often proposed is that we should do a better job of convincing people that vaccines are safe. I’m all for it. But I would also suggest that we should stop basing our vaccination policies on models that made sense in a world of constrained vaccine supply, and aim for 100% vaccination coverage among those who can get vaccinated. This would also solve another problem, often glanced over: There are many people who cannot get vaccinated for medical reasons, either because they are too young, or because they have other conditions that prevent them from acquiring immunity through vaccination. More importantly, there is an ethical argument to be made for the goal of 100% vaccination coverage. It sends the right message. Everyone who can get vaccinated, should get vaccinated – not only to protect themselves, but to protect those who can’t, through herd immunity.